News items concerning the artist, Jan Balet Art Preservation LLC, and the website. Also included are media releases relating to the website and activities of the company. 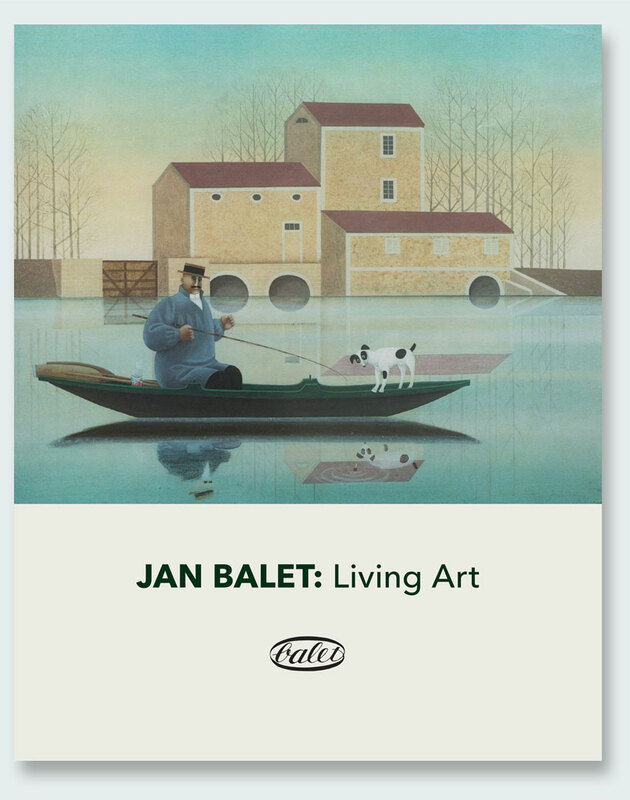 New book - Jan Balet: Living Art - a collection of essays about the artist's life and work. 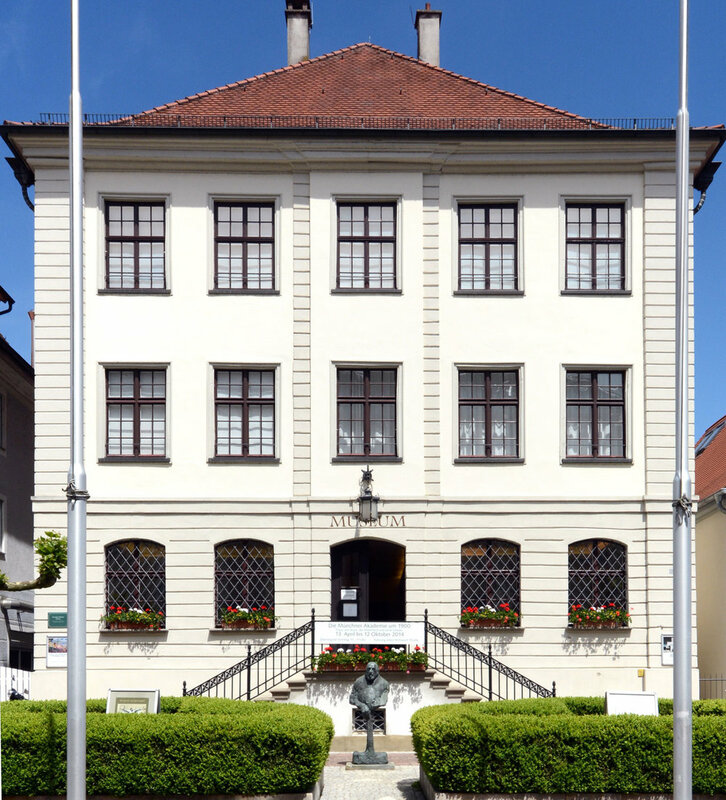 Langenargen, Germany - In celebration of the 10th anniversary of Balet’s death, the Langenargen Museum honors the painter and illustrator with an exhibition of his work. Titled Reflections of the Naive - Jan Balet as Painter, Graphic Artist and Illustrator the exhibition comprises his paintings, graphic works, commercial illustrations, as well as his children’s books. He created multilayered, often satirical images in a distinctive surreal style that contradict his misleading reputation as a naive artist. The exhibition runs from March 24 through October 27. In addition, Jan Balet’s Image Journeys - from the Lake of Constance to Distant Countries debuts at the Lakeside Art Park in Langenargen August 9 to October 31. Let yourself be inspired by the emotions and human nature in the images of Jan Balet. Balet, Jan. To the Left You See the White House, 1990, lithograph, 19 1/2” x 25 1/2”. © Peter Balet. 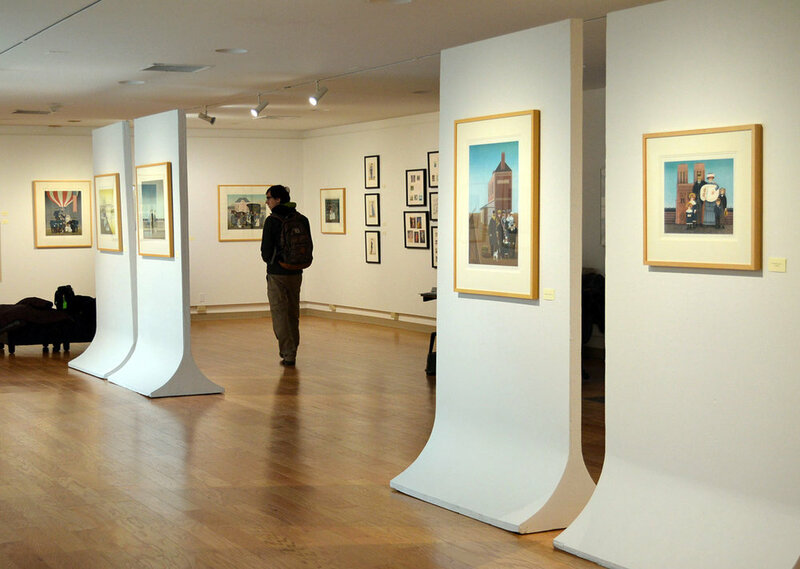 Queensbury, NY – Lithographs and associated watercolor renderings by German-born artist Jan Balet (1913-2009) travels from the Plattsburgh State Art Museum to SUNY Adirondack. Titled What Was He Thinking? Jan Balet: Watercolors and Lithographs, the exhibition opens at the college’s Visual Arts Gallery on Wednesday, September 5 and runs through Thursday, November 8, 2018. Curated by Dr. Sheldon Hurst, Portland, Oregon Art Curator and Professor Emeritus at SUNY Adirondack, What Was He Thinking? highlights Jan Balet’s masterful lithography and features the artist’s humorous and personal perceptions of human relationships and situations. It also includes several large paintings and many miniature watercolors Balet painted as part of his inspirational process. The juxtaposing of the watercolor sketches with the artist’s acrylic paintings and subsequent lithographs illustrates the breadth of his work and the attention he paid to detail, color, and form. According to Peter Balet, the artist’s only son, the exhibition is the culmination of many years of developing avenues to broaden audiences in the US for his father’s work. Saratoga Springs, NY – The family of German-American artist Jan Balet (1913-2009) announces the release of a new book of essays that explore the artist’s life and work. Titled Jan Balet: Living Art, the book is a tribute to the artist, who was renowned as a mid-century New York art director and graphic designer and throughout Europe as a fine artist and lithographer. A true Renaissance man, Balet imbued all of his works with a unique style of painting that captured the humor and incongruity of the human circumstance. Essayists for the new publication include former gallery director and professor emeritus of SUNY Adirondack Dr. Sheldon Hurst, Professor Norman Taber of SUNY Plattsburgh, and Professor Di Kivi of SUNY Adirondack. Each of the essays speak to a different aspect of the artist’s life and art. Included are an overview of his life and work by Dr. Hurst, a look at Balet’s years as an award-winning graphic artist and art director in New York City by Professor Taber, and a piece on the artist as a children’s book author and illustrator by Professor Kivi. The full-color, soft cover book also contains more than forty examples of Balet’s watercolors, paintings, lithographs, and mid-century commercial art. Published by Jan Balet Art Preservation LLC, the company created by the family to promote Balet’s work, Jan Balet: Living Art can be pre-ordered via the janbalet.com website and is expected to be available to ship mid-April. The 96-page book costs $25.00 and those pre-ordering by April 14, 2018 will receive a discounted price of $20.00. For more information, visit janbalet.com/shop. Plattsburgh, NY – Lithographs and associated watercolor renderings by German-born artist Jan Balet (1913-2009) will be on view in an exhibition beginning Monday, February 12th at SUNY Plattsburgh. Titled What Was He Thinking? Jan Balet: Watercolors & Lithographs, the exhibition opens in the Burke Gallery at the Myers Fine Arts Building, SUNY Plattsburgh on February 12 and runs through March 14, 2018. Curated by Dr. Sheldon Hurst, Portland-based art curator and former manager of the art gallery at SUNY Adirondack and art educator at The Hyde Collection in Glens Falls, NY, What Was He Thinking? highlights Jan Balet’s masterful lithography and features the artist’s humorous and personal perceptions of human relationships and situations. It also includes several large paintings and many miniature watercolors Balet painted as part of his inspirational process. The juxtaposing of the watercolor sketches with the artist’s acrylic paintings and subsequent lithographs illustrates the breadth of his work and the attention he paid to detail, color, and form. Well known for his paintings and prints which were widely collected in Europe, particularly in Germany, Switzerland, and France, Balet is better remembered in the US for his commercial art in the mid-twentieth century, when he worked as an illustrator and art director in New York for the likes of CBS Television, Vogue, Seventeen, Mademoiselle, and Saturday Evening Post. However, the art he produced in Europe in the latter part of his life was available and collected in the US. The lithographs that serve as the basis for the exhibition are part of an extensive group owned by California collector Michael and Alison Paolercio. At the conclusion of the run in Plattsburgh, the exhibition will travel to the SUNY Adirondack Visual Arts Gallery in September. Jan Balet Art Preservation LLC was established by the artist’s son and his wife, Marie, to expand interest in and enjoyment of the full breadth of Jan Balet’s art. For more information concerning the exhibition, contact bloughke@plattsburgh.edu or info@janbalet.com. To learn more about the artist and his works, visit www.janbalet.com. For the first time... the charming children's book João is available in Portuguese. João is now available through Kalandraka (Matosinhos, Portugal). Saratoga Springs, NY – Little did the family of German-American artist Jan Balet (1913-2009) expect that the website they created to highlight the artist and his work would prompt a message from a professor at the University of Lisbon. But that is exactly what occurred. Several months ago, an art professor at the Faculty of Fine Arts of the University of Lisbon happened upon the janbalet.com website and discovered reference to a favorite book from his childhood. He was immediately drawn to the idea that Balet’s tale of a young boy from a Portuguese fishing family would still be relevant to children in Portugal today. This marks the third time in recent years that a children’s book by Jan Balet was selected for reprint. Balet was working in New York City as a graphic illustrator when he created his first book for children – Amos and the Moon – as a Christmas gift for his only son. Long out of print, the book returned during the 2015 holiday season through the efforts of Jan Balet’s family – working with U.S. publisher Ammo Books. Ammo is also responsible for the 2016 reissuance of The Five Rollatinis, the story of a young boy who seeks to find his place in his family’s circus act. During the early years of his career, Jan Balet lived in the U.S., working as a graphic artist and art director for such magazines as Seventeen and Mademoiselle. Although he had become a U.S. citizen, he moved back to Germany in 1965 and focused his efforts on the fine arts, including painting, lithography, and etching. He is the author and illustrator of more than ten children’s books and created the illustrations for dozens of children’s books penned by other writers. Following Jan’s death in Switzerland in 2009, Peter Balet and his wife Marie established Jan Balet Art Preservation LLC. After much research regarding Jan Balet and his art, the company launched a website – janbalet.com - in November 2015 designed to introduce new audiences to the full breadth of the artist’s work. The Portuguese company has begun work on the project and the book is expected to be available this October for the 2017 holiday season. Jan Balet. Market Day in Normandy. Lithograph. 1978. 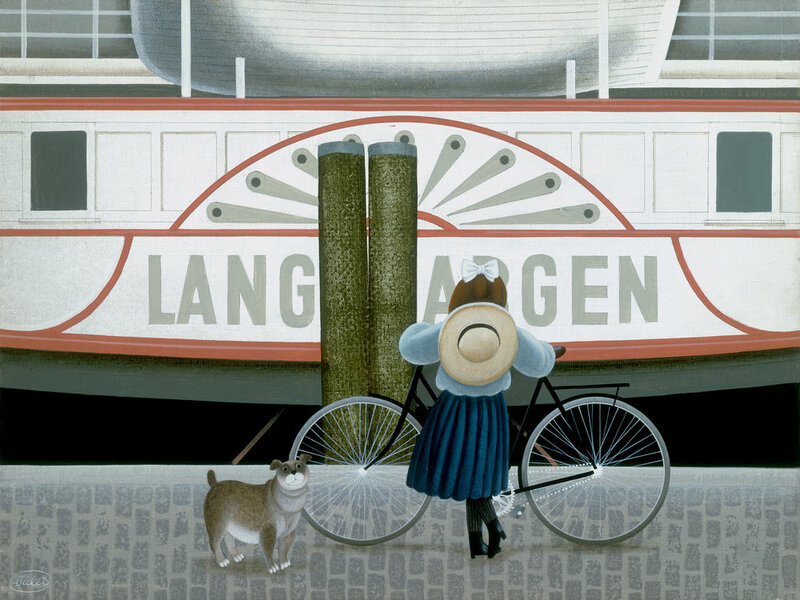 Saratoga Springs, NY – Lithographs and associated watercolor renderings by German-born artist Jan Balet (1913-2009) will be exhibited for the first time in the United States this fall. Curated by Dr. Sheldon Hurst, Portland-based art curator, the exhibition, titled What Was He Thinking? Jan Balet: Watercolors & Lithographs is set for display at ArtReach Gallery, First Congregational Church of Christ in Portland, Oregon from December 3, 2017 through January 14, 2018. According to Peter Balet, Saratoga resident and the artist’s only son, the concept for the exhibition evolved from a contact he received shortly after Jan Balet Art Preservation LLC launched its website (janbalet.com) in 2016. The Balet family had worked for several years following the artist’s death to learn more about the full breadth of his works. They teamed with Hurst, former art history professor and director of the Visual Arts Gallery at SUNY Adirondack, to document many of their findings. Hurst, now living in Oregon, volunteered to travel to California to view the lithograph collection and immediately began working on the idea of using the collection as the basis for an exhibition. At the conclusion of the run in Oregon, the exhibition will travel to the Burke Gallery at the Plattsburgh State Art Museum, Plattsburgh, NY, where it will be on display from February 12 through March 16, 2018. In addition, the exhibition is scheduled to be shown at the SUNY Adirondack Visual Arts Gallery in Queensbury, NY from September 5 through November 8, 2018. Jan Balet Art Preservation LLC was established by the artist’s son and his wife, Marie, to expand interest in and enjoyment of the full breadth of Jan Balet’s art. Jan is mainly known in the U.S. for his commercial art from the mid-twentieth century, when he illustrated for the likes of CBS Television and popular magazines such as Vogue, Seventeen, Mademoiselle, and Saturday Evening Post. He later moved back to Europe, where he spent the rest of his life painting and producing prints of his works. For more information concerning the exhibition, visit News & Views or contact info@janbalet.com. Saratoga Springs, NY – German-born artist Jan Balet (1913-2009) will be the topic of a talk by his son and daughter-in-law Peter and Marie Balet. The talk will take place at the Saratoga Springs Public Library, Saratoga Springs, NY on Thursday, January 26th at Noon. The talk titled “The Life and Art of Jan Balet” will cover the fascinating story of Jan’s life, from his escape from Hitler’s army, through his days as a highly successful commercial artist, art director, and children’s book author and illustrator in New York City, to his later years as a fine artist residing in Europe. Balet created a name for himself in Europe during the middle and later years of his life with his paintings, lithographs, and etchings. The main presenter, in addition to being the wife of the artist’s only son, is also co-creator of Jan Balet Art Preservation LLC, the company established by the couple to expand interest in and enjoyment of the full breadth of Jan Balet’s art. Jan is mainly known in the U.S. for his commercial art from the mid-twentieth century, when he illustrated for the likes of CBS Television and popular magazines such as Vogue, Seventeen, Mademoiselle, and Saturday Evening Post. The Balets have been working on documenting the artist’s works since his death in 2009 and recently authorized the reprint of two of the artist’s children’s books – Amos and The Moon and The Five Rollatinis, which will be available at the talk. Jan Balet books, Amos and the Moon and The Five Rollatinis, will be on display (for sale) at the Chronicle Book Fair this Sunday, November 6, 11 am to 3 pm at the Queensbury Hotel, Glens Falls. Northville, NY – German-born artist Jan Balet (1913-2009) will be the topic of a talk by his son and daughter-in-law Peter and Marie Balet. The talk is sponsored by the Sacandaga Valley Arts Network and will take place at the Northville, NY Public Library on Tuesday, August 30th at 6:30 pm. The Balets have been working on documenting the artist’s works since his death in 2009 and recently authorized the reprint of two of the artist’s children’s books – “Amos and The Moon” and “The Five Rollatinis”, which will be available at the talk. To learn more about the artist, visit janbalet.com. Saratoga Springs, NY – For the second time in less than a year, a U.S. publisher has selected for reprint a children’s book by German-born American artist Jan Balet. The newest revival of the artist/author’s book – The Five Rollatinis – tells the tale of the youngest of a family of circus performers who is trying to find a place for himself, not only in the family act, but in his world. Wrapped within this charming story is a lesson in counting for young readers. Balet was working in New York City as a graphic illustrator when he created his first book for children – Amos and the Moon – as a Christmas gift for his only son. Long out of print, the book returned during the 2015 holiday season through the efforts of Jan Balet’s family – working with Ammo Books. The publisher is also responsible for the recent reissuance of The Five Rollatinis. During the early years of his career, Jan Balet lived in the U.S., working as a graphic artist and later as art director for such magazines as Seventeen and Mademoiselle. Although he had become a U.S. citizen, he moved back to Germany in 1965 and focused his efforts on the fine arts, including painting, lithography and etching. He is the author and illustrator of eight children’s books and created the illustrations of dozens of children’s books penned by other writers. According to the artist’s son, Peter, one of his father’s unique gifts was his ability to translate life lessons into fun stories with characters and illustrations based on places the artist had visited or unusual places he had imagined. Following Jan’s death in Switzerland in 2009, Peter Balet and his wife Marie established Jan Balet Art Preservation LLC after much research regarding Jan Balet and his art. The company launched a website – janbalet.com - in November 2015 designed to introduce new audiences to the full breadth of the artist’s work. The Five Rollatinis and Amos and the Moon can be purchased for $17.95 each via Ammo Books.com. Saratoga Springs, NY – In 1948, a German-born artist working in New York City as a graphic illustrator created a very special book as a Christmas present for his only son. Once published, Amos and the Moon captured the imaginations of children all over the world. Long out of print, the book returns this year as the family of the artist, Jan Balet – working with Ammo Books - is reissuing this charming tale of a young boy trying to capture the moon. When the book was originally published, Jan Balet was living in the U.S. and was in the early years of his career. He devoted his mid- and later years to the fine arts, including painting, lithography and etching. He is the author and illustrator of eight children’s books and created the illustrations of dozens of children’s books penned by other authors. According to the artist’s son, Peter, for whom Amos and the Moon was written, his father had a special skill when it came to imagining drawings that would engage young minds and make adults smile, as well. Following Jan’s death in Switzerland in 2009, Peter Balet and his wife Marie established Jan Balet Art Preservation LLC after much research regarding Jan Balet and his art. The company launched a website in November 2015 designed to introduce new audiences to the full breadth of the artist’s work. Amos and the Moon can be purchased for $17.95 via Ammo Books. Saratoga Springs, NY – The only son of German-born artist Jan Balet shares a wish with his wife. That wish is that American audiences will come to know and appreciate his father’s expansive body of work and not simply the commercial illustrations that made him successful in the U.S. Although fans of mid-twentieth century commercial art in the U.S. will recognize the Balet name, many only know him for his early work as an illustrator for the likes of CBS Television and popular magazines such as Vogue, Seventeen, Mademoiselle, and Saturday Evening Post. According to the artist’s son, Peter, however, the award-winning commercial illustrations his father produced while the naturalized U.S. citizen worked in New York City from 1940 to 1964 give but a single dimension to this artist’s skill. In addition to his illustrations, Jan Balet created a name for himself in Europe during the middle and later years of his life with his paintings, lithographs, etchings, watercolors, and even children’s books. Following Jan’s death in Switzerland in 2009, Peter Balet and his wife Marie determined to provide the means for artists and those interested in art to have access to a greater look at the expanse of Jan’s work. The couple spent years researching Jan’s life and art, even travelling from the U.S. throughout Europe to visit places Jan had called home and learn more about the man and his art. The website launched today and includes a blog that will highlight little-known aspects of Jan’s life and provide an avenue for interpretation of his works.